Welcome to Our Digest of Classical CD Reviews, SACD Reviews, and DVD Reviews. We are the internet’s first, and foremost, all-classical music magazine. 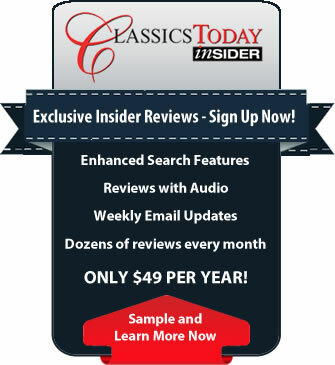 You can enjoy free access to all of our thousands of reviews of CDs, SACDs, and DVDs. Professionals from around the world contribute current, comprehensive, and accurate reviews of compact discs and other recorded classical music. As our guest, you will also enjoy our feature articles, editorials, concert reviews, special offers, and giveaways. Please come back often as new material is added daily! Our review digests archive list, alphabetically by composer when clicked on will list EVERY review we have ever written about them listed by date published most recent to least. To access a review, simply scroll down the page and click on the row you wish to view. In addition, you can use the search form on the right to search our complete review database. You can also visit our home page to see what is new and to explore our full range of offerings. Be sure to bookmark classicstoday.com for convenient access to everything you need to know about classical music recordings.